Twin Dolphin Beach was the local name given to the proper Mexican name, Playa Las Viudas, of this popular Tourist Corridor Beach The signs along the highway now show Playa Las Viudas. Note: The Hotel Twin Dolphin is no longer in operation. It has been closed since 2006. The buildings were demolished during late 2006 or early 2007. The Chileno Bay Club is now under construction on this site. The area is undergoing development at this time. Beach access is marked and remains open, but watch for heavy construction equipment along the access road. Access: You can access the beach at km 11.5, along the Tourist Corridor. Take the dirt road about 700 meters toward the ocean. There is a small parking lot and portable toilet facilities. Travel writer Larry Dunmire talks about Twin Dolphin Beach in the article below written in the late 1990’s. If you discover this beach, you have discovered one of my favorite places. Tucked away by the Hotel Twin Dolphin, Playa Las Viudas seems to almost always be secluded. Even if there are people around, you might never know due to the beaches unique little coves and volcanic rock formations. This is the perfect place to sun yourself for an afternoon (in the buff if you’d like) and have a picnic, while enjoying the peaceful and serene nature that surrounds you. The photo on the left was taken August 2010. The sapphire ocean off Playa Las Viudas beach shimmers in the sun, reflecting the reefs below, creating extraordinary beauty that makes the trip to this primitive beach inviting. These reefs are great for snorkeling, diving, and swimming; however, it is wise to use caution and only swim when the water is calm. Bring along your beach essentials: umbrella, hat, sun screen, lotion, water and anything else you deem necessary, since supplies are not available nearby. To find this charming retreat in paradise, turn right at KM 12.5 just before the Hotel Twin Dolphin entrance and follow the dirt road for about 7/10th of a mile down to the beach. At certain times of the year, the sand can be relatively deep and soft and may require 4 wheel drive, but for the most part the road is navigable by any vehicle. 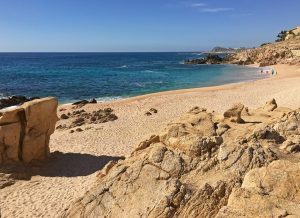 There are several secluded spots in this area as you continue west along the beach toward the Cabo del Sol Golf Course and development. 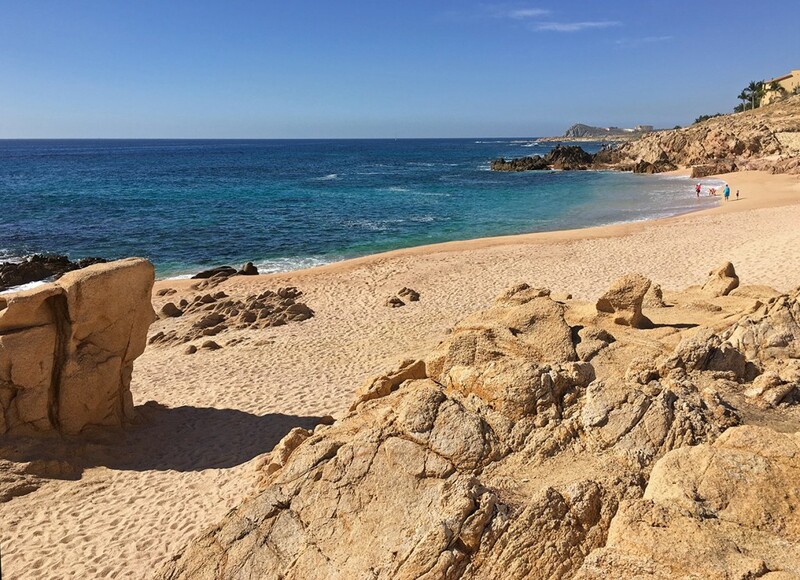 So enjoy a relaxing afternoon away from the bustle of downtown Cabo San Lucas and allow yourself to transcend to a more natural Los Cabos beach experience.